Pomegranate juice (PG) was recently studied in a randomized placebo-controlled trial conducted by the Nephrology Department of the Western Galilee Hospital, Israel. The study showed an increase in innate immune function and a decrease in the progression of the atherosclerotic processes. Pomegranate juice contains vitamin C as ascorbic acid and polyphenolic flavanoids with the highest concentration in the juice from its skin. Tests show it has more potent antioxidant effects than red wine. An earlier paper on pomegranate juice reported in patients with high blood pressure that a reduction of 2-5mm systolic pressure reduces risk of CV complications. This paper from Galilee Hospital reported the effect on kidney dialysis patients who drank just 100 cc PG three times per week for 12 months. People with kidney failure who are on dialysis are prone to heart and cardiovascular system problems. In fact, the major cause of death in dialysis patients is cardiovascular related. The results were quite staggering. These three factors had not been studied in hemodialysis patients before with juice. A significant reduction in triglyceride levels in pomegranate juice-treated group, but not in the placebo group. – There was a more significant reduction in triglycerides in patients with a baseline triglycerides level of over 200 mg/dl. 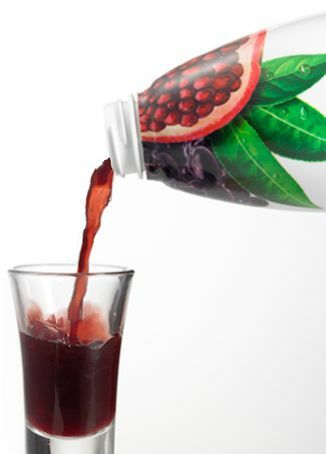 A 22% reduction in number of anti-hypertensive medications taken by the pomegranate juice treated group. No Side Effects were noted during the study period. The biologically active components in Pomegranate juice that have been found to be protective against certain types of cancer are called ellagitannins ( a class of polyphenols). Ellagitannins can be further metabolised in gut into Ellagic acid and further into urolithins by the microfloria. Ellagic acid as an isolate has been shown to be able to inhibit the binding of carcinogens to DNA, of note the caniogens nitrosobenzylmethylamine (NBMA) known to cause esophageal cancer (5) and benzo[a]pyrene a well-known carcinogenic, mutagenic and teratogenic compound (6). Ellagic acid as an isolate also has potent antioxidant properties. Invitro studies on Urolithins have shown they can deactivate at least 2 cancer growth pathways. The first pathway cited is the MAPK pathway(1,2), the MAPK is chain of proteins that is involved in cellular growth and differentiation, in cancer they can get stuck in the “on“ position signalling uncontrolled growth (tumorigenesis) and resistance to apoptosis (programed cell death)(3). 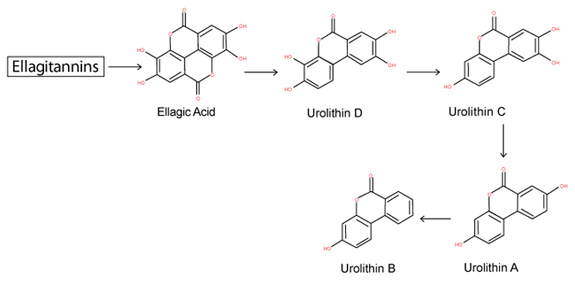 The other pathway of significance which Urolithins can inhibit is the Wnt pathway which is again responsible for cellular proliferation and differentiation, in colon cancer up to 90% of tumours show mutation in this pathway resulting in unregulated cellular growth and proliferation(4). Urolithins because of their abundance in the gut show very encouraging results for colon cancer. While the metabolites of ellagitannins have experimentally shown anti-cancer properties, ellagitannins as a complete compound have in some studies been found to be more potent than the isolated metabolites. David Geffen from Center for Human Nutrition, School of Medicine, University of California showed that it was ellagitannins that supressed colon cancer cell inflammatory enzymes and that when Ellagic acid was administered on its own it was not effective. In another study it was found that pomegranate fruit extract modulates the expression of Cyclin-dependent kinase inhibitor protein which functions as a tumor suppressor gene, resulting in the inhibition of cell growth and apoptosis (programmed cell death) of the tumor (7). These examples highlight the benefit of a whole food extract over to an isolate. Gonzalez-Sarrias A, Espin JC, Tomas-Barberan FA, Garcia-Conesa MT. Comparative transcriptional analysis reveals key cell cycle and MAPK signaling genes involved in the S-G2/M-phase arrest of Caco-2 cells exposed to ellagic acid and its colonic derivatives, urolithins. Mol Nut Food Res. 2009;53:686–698. Arzu Akpinar-Bayizit, Tulay Ozcan and Lutfiye Yilmaz-Ersan . The Therapeutic Potential of Pomegranate and Its Products for Prevention of Cancer Uludag University Turkey. This entry was posted in Nutrition, Practitioner, Uncategorized and tagged Ellagic acid, Ellagitannins, polyphenolic flavanoids, Pomegranate juice, Tr, Urolithins by HQH Fitness. Bookmark the permalink. Ich habe eine ganze Weile auf Webseiten gesurft. Ich schätze mal so ca. 3 Stunden und habe in diesem Zeitraum keinen so interessanten Beitrag gefunden, wie deiner.Weiter so!